The first rough budget, presented to City Council in the summer of 2017, for the Calgary 2026 Winter Olympic Bid was CDN $4.6B. (Click the pie chart to the right). 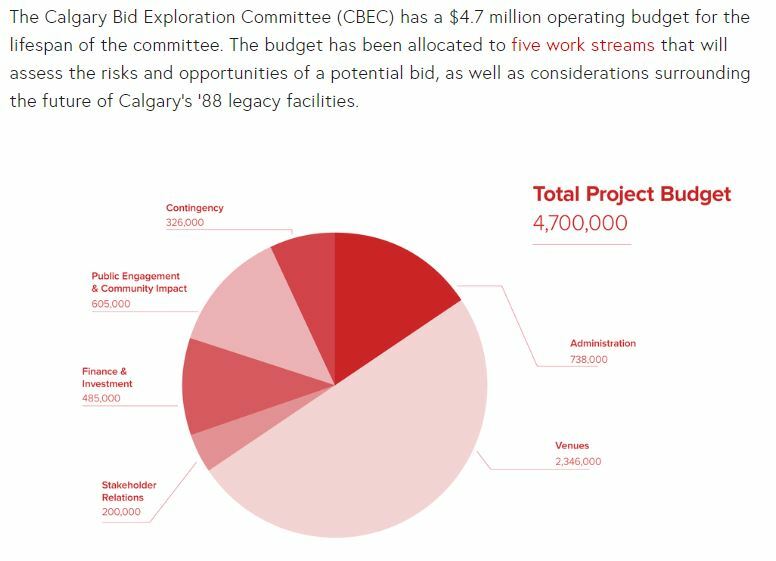 After spending about $30 Million on a more formal evaluation, a more thoughtful budget of CDN $5.23B was presented to Calgary Council in September 2019. Here is a breakdown of the proposed spending. If you want even more detail you can dig through the 87 page official Hosting Plan HERE. In case you are wondering the 1988 Calgary Olympic Winter games cost CDN$829,000,000 which was 55% over budget.